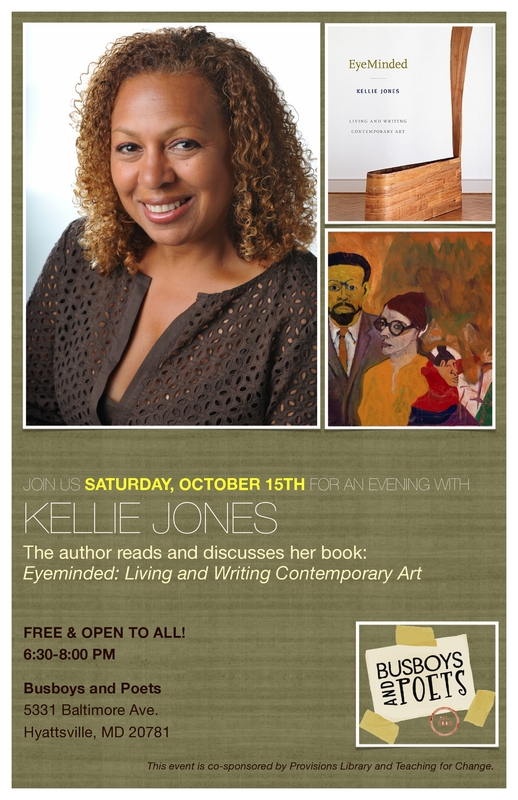 Please join Busboys and Poets, Teaching for Change and Provisions Library for an evening with author Kellie Jones, who will read and discuss her book, Eyeminded: Living and Writing Contemporary Art on Saturday, October 15th, from 6-7:30 p.m. at Busboys and Poets (5331 Baltimore Ave., Hyattsville, MD 20781). A daughter of the poets Hettie Jones and Amiri Baraka, Jones grew up immersed in a world of artists, musicians, and writers, absorbed in Black nationalist ideas about art, politics, and social justice across the river in Newark. The activist vision of art and culture that she learned in those two communities, and especially from her family, has shaped her life and work as an art critic and curator. Featuring selections of her writings from the past twenty years, Eyeminded reveals Jones’s role in bringing attention to the work of African-American, African, Latin-American, and women artists who have challenged established art practices.